This article describes the United States presidential election, 1956, in Missouri. With the exceptions of the 1956 election, the 2008 election, and the 2012 election, Missouri has chosen the eventual winner of each U.S. presidential contest since the 1904 election. Democrat Adlai Stevenson narrowly won the state over the Republican Incumbent, Dwight Eisenhower, thanks in large part to a 72,000-vote margin in St. Louis. 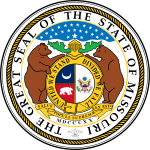 Missouri has voted in presidential elections since 1820. ^ Although he was born in Texas and grew up in Kansas before his military career, at the time of the 1952 election Eisenhower was president of Columbia University and was, officially, a resident of New York. During his first term as president, he moved his private residence to Gettysburg, Pennsylvania, and officially changed his residency to Pennsylvania. This page was last edited on 28 March 2019, at 03:53 (UTC).